Overhead conveyors adapted for floor mounting help keep things moving smoothly at Shadwood Enterprise Limited. The company’s new production facility in North Bay, Ontario manufactures automatic portable battery charger units. From the beginning, Shadwood management knew what it wanted – a smooth, orderly production operation. After a floor layout was prepared, Pacline Corporation of Mississauga was asked to design and supply a conveyor system to handle the product through each stage of assembly. PACLINE’s conveyor systems are usually used as overhead conveyors, however, for this application a unique twist was required. 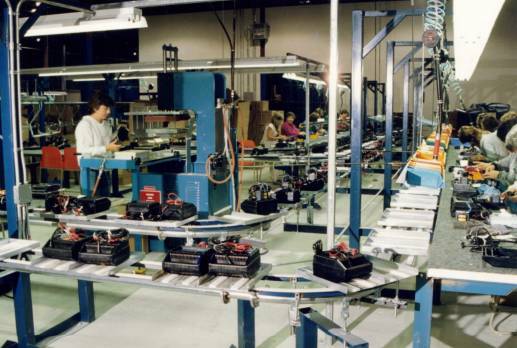 In the North Bay facility, the Pacline Conveyor is inverted and floor mounted. Installing the overhead system in this manner allows Shadwood to convey trays fixed to the conveyor chain. Each 16 x 12 inch tray contains two compartments and is mounted on a 24-inch center. The floor stand frame supports the light banks and carpet faced assembly tables, which are 18 inches wide. “A particular advantage is that empty trays, and trays of “kitted” component groups are constantly circulating past the assembly operators. If they are not ready for the tray the first time round, it will pass by again. As the assembled units pass through the testing area, they are tested, labeled, and once again returned to the line. The final process is packaging. Operators remove the finished product, and seal package it in a clear plastic protective shell. From here, the conveyor system transports them to the boxing, and palletizing area. The lines have been designed and integrated to minimize work in process on the shop floor. Bottlenecks and balancing problems are readily noticeable.